If you're a long-time subscriber, you might remember when I used to include a sentence diagramming puzzle in each newsletter. 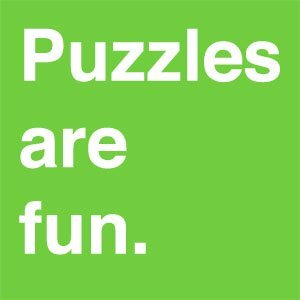 I thought it would be fun to do a few puzzles today. Solving them is sort of like going on an Internet/grammar scavenger hunt. If you're new to diagramming sentences, don't worry. Just see what you can do! If you've already learned some sentence diagramming, test yourself to see if you can correctly diagram all of the sentences. Directions: Use the clues below to see if you can figure out each sentence and how to diagram it. You'll find the answers at the bottom of the page. Have fun! This is a famous Patrick Henry quote. Give me _______ or give me death! This is a compound sentence. That means it has two independent clauses. 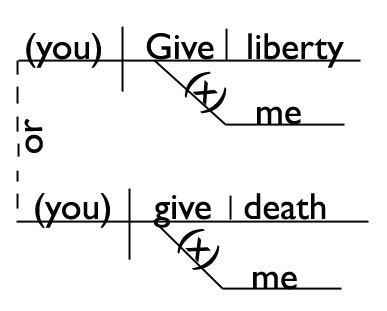 Both of the clauses are commands (imperative sentences). 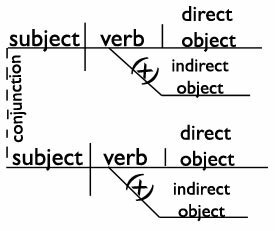 Both of the clauses have a direct object and an indirect object. This sentence is a slogan from Sara Lee. Split the contraction doesn't into two words. Does is a helping verb, and n't is an adverb. This sentence contains a verb phrase. The main verb is transitive active. That means that it has a direct object. The direct object is a proper noun. This sentence is the first line of the poem On the Grasshopper and Cricket by John Keats. It reminds me that the world is full of life even in the middle of cold, icy winters. This sentence has a linking verb with a predicate adjective. This sentence contains a prepositional phrase that is functioning as an adjective. Complete and diagram the following sentence. Sir Francis Bacon said, "________ is power." This is a complex sentence. It contains an independent clause and a dependent noun clause. The dependent noun clause is acting as the direct object of the verb said. Nobody doesn't like Sara Lee. Sir Francis Bacon said, "Knowledge is power." Do you want to learn more? Learn how to diagram sentences with this book or this program. I finally passed my exam! Thank you very much!